One key clutter area for many of my clients is the kitchen island or counter. The kitchen is often the hub of the home, in constant use, and where kids drop their backpacks, bills are paid, and dinner is prepared. How do you keep this busy area clear? Get rid of the stuff that doesn't belong, every day. All kinds of things end up in the kitchen. Be relentless in weeding out the items that don't need to be on the counter. And this is the most important step: do this every day and you'll be able to keep the area clear. Identify a home for the items hanging around. Relocate things to other rooms and put them away. If papers are piling up, try a desktop file box or paper sorter. Have a homework station for your kids that doesn't stay on the counter. Create a "landing pad" for your keys, phone and bag that isn't the counter. Create a "drop spot" for your kids backpack, or use hooks by the door. Help kids learn a routine that works for your family, such as: unpack the backpack and lunch box, do homework, put backpack away. 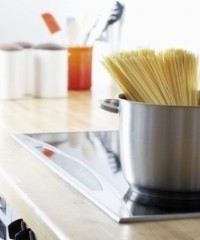 Keep only daily use appliances on your kitchen counters. Appliances used less often should be away in cabinets. Once your counters get some breathing space, enjoy it! With a five minute daily routine of clearing the clutter, you can keep it that way.